This is the first SMACC-Back for SMACCgold. The creator of the lecture that led to this was Simon Carley. Simon is a brilliant emergency physician and lecturer who practices at St. Emlyn's. I can only imagine he was expecting this SMACC-Back as he all but threw his metal glove on the ground in front of me (all in good fun). Unfortunately, I was in another session during this lecture, but I've been eagerly awaiting it as many of the EMCritters came up to me afterwards to tell me about it. My response will make no sense if you don't listen to Simon's talk first, so here it is. I advise watching the video, because I love watching the emotions flash across his face whenever he is lecturing–truly a captivating speaker. Also, please read the original post on St. Emlyn's. Diffusion of innovations is a theory that seeks to explain how, why, and at what rate new ideas and technology spread through cultures. Everett Rogers, a professor of communication studies, popularized the theory in his book Diffusion of Innovations; the book was first published in 1962, and is now in its fifth edition (2003). The book says that diffusion is the process by which an innovation is communicated through certain channels over time among the members of a social system. The origins of the diffusion of innovations theory are varied and span multiple disciplines. The book espouses the theory that there are four main elements that influence the spread of a new idea: the innovation, communication channels, time, and a social system. This process relies heavily on human capital. The innovation must be widely adopted in order to self-sustain. Within the rate of adoption, there is a point at which an innovation reaches critical mass. The categories of adopters are: innovators, early adopters, early majority, late majority, and laggards (Rogers 1962, p. 150). Diffusion of Innovations manifests itself in different ways in various cultures and fields and is highly subject to the type of adopters and innovation-decision process. Anyone who looks at new evidence with tabula rasa is missing the point and is likely to get things wrong. Not only do we filter new evidences through out beliefs, we must do so. It is not irrational, it is essential-the process should be a willful and deliberate filtration of new information through your existing schema. Scott Weingart. 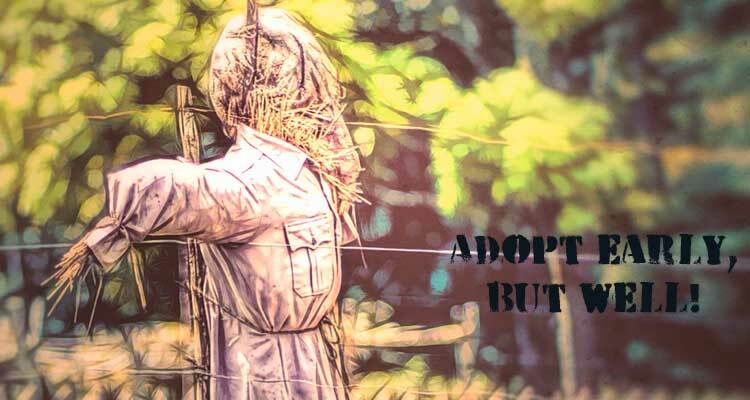 SMACC-Back – On the Beliefs of Early Adopters and Straw Men. EMCrit Blog. Published on June 24, 2014. Accessed on April 22nd 2019. Available at [https://emcrit.org/emcrit/on-the-beliefs-adopters-straw-men/ ]. dont put your grandparents on a boat and burn it? well thats good to hear! with Caseys recent post on physics and metacognition and now this wee on deeply philosophical concepts of knowledge and meaning..my head is about to hurt. but thanks, its a good hurt! Video link was good, check your plugins. Spelling error corrected, much thanks. I’ve recorded a SMACC Back on the podcast site here. Spoiler alert – we agree on a LOT. You’ve defended early adoption admirably although there are two sides to every discussion and what I have tried to do (and I think succeeded) is to make people think. You’ve articulated a lot of what I, and probably many others, think on the subject. It’s a great topic for discussion and helps everyone reflect on how quickly/slowly to move on new evidence. I think there is something about the institutional position on the bell curve too; St Emlyn’s ED tends to be an early adopter in terms of resuscitation techniques/technologies, so it appoints people who want to do this and it becomes self-perpetuating – I’m guessing Janus General New York is fairly similar. The discomfort and problems come if your personal bell curve doesn’t match your institution’s, or if two departments in the same institution (ED and anaesthesiology or ED and orthopedics/trauma surgery come to mind) don’t match. Back to Chris’ point on how to move the curve faster to get to the laggards. Would be interested to know how others approach encouraging their laggards along 🙂 and hoping to see Simon and Scott on the same stage in Chicago. such a fantastic point! i can do the things I do b/c I am the division chief at Janus General. I could easily be stymied if I was a new attending at the wrong shop.